Passages to the Past: Guest Post by Anna Belfrage & Giveaway of Days of Sun and Glory! Guest Post by Anna Belfrage & Giveaway of Days of Sun and Glory! 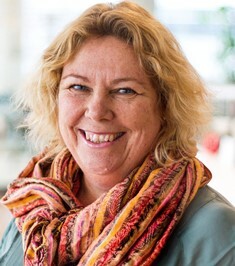 Today on the blog, I have the loverly and amazingly talented writer, Anna Belfrage! Anna is here to talk about her latest novel, the second book in her King's Greatest Enemy series, Days of Sun and Glory! If you have yet to read one of Anna's books, I highly recommend you check her out. The historical blog world adores her, as do I! There is a giveaway at the bottom of this post, so be sure to enter! My recent release, Days of Sun and Glory, is the second in my series The King’s Greatest Enemy. Very briefly, the situation can be summarised as follows: We’re in 14th century England, Edward II is king, Roger Mortimer has fled to France from where he plans revenge, royal favourite Hugh Despenser is his normal nasty self and Queen Isabella has had it with hubby and joined Mortimer’s camp. In the midst of all this mess, my fictional protagonist Adam de Guirande with wife Kit have to navigate a political quagmire that can lead to death and ruin for them both. A nice, emotional tangle – and one which features a child, the young Edward of Windsor, heir to the throne. I enjoy writing about young boys growing into men. I suppose this is due to the fact that I’ve got three sons of my own, and so I’ve watched the process at close range. I’ve salvaged boys from pools when they insisted they could swim despite being only three, I’ve blown on scraped knees, picked splinters of wooden arrows out of tear-filled eyes. I’ve also seen big brother sit for hours with baby brother in his arms, crooning softly as he rocked him to sleep, and I’ve been the recipient of many, many long and warm hugs – wordless expression of love just when I needed it the most. When Days of Sun and Glory opens, Prince Edward is eleven. It is late 1323. Edward II spends most of his time with Hugh Despenser and worries constantly about the whereabouts of Roger Mortimer, the king’s “Greatest Traitor” who has managed to escape the Tower. England is an unhappy realm: the king and Despenser pursue all potential allies to Mortimer, and a substantial number of men are hauled before the assizes on skimpy charges of treason. Prince Edward would have been aware of the unrest – but insulated from it. As a young prince, he’d have spent most of his childhood with his own household at some distance from the royal court. However, as 1323 rolled into 1324, our Edward’s life was affected by the increasing hostility between his mother and father. There were various reasons for this: Isabella of France resented the hold Hugh Despenser had over her husband and detested being marginalised by the royal favourite. Edward II viewed his wife with increased suspicion – not only was she French (and England was at war with France) but her dislike of Despenser could be construed as support for Mortimer. Caught in the middle of their disintegrating marriage was their young son. In the case of Isabella and Edward II, the king had all the trump cards. His wife was his wife, no more, no less, and he was in a position to restrict her independence, thereby neutralising any danger she might pose to him and his favourite. Which was why he decided to deprive her of her dower lands in 1324. This was a major slap in the face for Isabella – as part of their marital contracts, lands had been set aside as her dower lands, e.g. lands she would hold outright should her husband predecease her. Also, the contract called for the income of such dower lands being made available to Isabella from day one of their marriage. In turn, she financed her household expenses, thereby effectively being in control of her own purse-strings. When Edward II deprived Isabella of her income, he reduced her to a dependent. Suddenly, she had no income but what he would chose to grant her, and as he had every interest of having her toe the line, she had markedly less money to spend. Isabella was furious – and unhappy, and humiliated. Even more so when Edward II then sent her French retainers into exile. Of course, her son sided with her – a young boy who sees his mother distraught and unfairly humiliated has a knee-jerk reaction to defend her. “Adam?” someone called, and he recognised his lord’s voice. Adam made as if to stand, when he heard another voice. The king. Adam sank back down. “My liege,” the prince said, and Adam heard the sound of cloth rustling as the lad bowed. “Your father,” the king said gently. “Come here, lad.” There was the sound of muted footfall, and when Adam sneaked a look, he saw Prince Edward enfolded in his father’s arms. Young shoulders were rigid, young arms hung passive, and after some moments the king released him. “Are you that aggrieved with me?” he asked. “It is not my place to be aggrieved, my lord.” Edward took a step or two backwards. “I am doing what I must to ensure the safety of my realm,” the king said. “To you, my lord? I try to do my duty by you as well – I always do.” The lad sounded on the verge of tears. “I have no choice,” The king said. The slap sent Prince Edward reeling. His head struck the wall, and Adam was hard put not to emerge from his hiding place to rush to his lord’s aid. The prince straightened up, wiped at his mouth and studied his bloody fingers. The king groaned out loud. “Maybe you had no choice, my lord,” Prince Edward said before ducking under his father’s arm and fleeing the chapel. 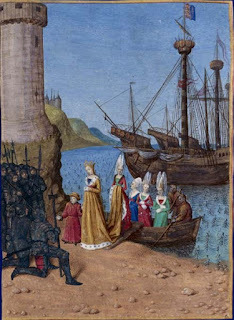 Somehow, Isabella overcame her humiliation and put a brave face on her new position in court. Her husband was pleased by her docility and concluded he could trust her enough to send her to France to negotiate on his behalf. The war in France had gone from bad to worse, and Edward needed a truce. Off Isabella went, and I dare say her son sighed with relief: Maman was back in Father’s good graces and a Happily Ever After hovered on the horizon. (You have to excuse the boy: he was too young to understand the concept of passion and revenge) In September of 1325, Prince Edward followed her across the Channel, newly invested as the Duke of Aquitaine to do homage on behalf of his father. He was never to see his father again. Once in France, it dawned on Prince Edward that the breach between his mother and father was deeper than he’d understood. His mother refused to return to her husband’s side – and said so publicly – unless the third person in her marriage (Despenser) made himself scarce. The English emissaries returned to England, but Prince Edward remained with his mother. Unwittingly, he had thereby become the most powerful weapon in his mother’s future attack on his father. At the time, no such attack was forthcoming: Isabella seemed content to remain at her brother’s court and salve her wounded pride. Until, in December of 1325, Roger Mortimer rode into the bailey of Charles IV’s castle. Soon enough, Mortimer and Isabella were constantly in each other’s company – day and night. They also forged an alliance to rid the world of Hugh Despenser. Was it their intention to also depose Edward II? No idea – and I suspect they didn’t have one either. In England, Edward II was enraged by his son’s extended stay in France – and his wife’s relationship with Mortimer. Letter after letter were sent across the sea to the prince, ordering him to return home ASAP. Except, of course, that Prince Edward was in no position to do so. Isabella was not about to let him go, not when he was the lynchpin on which her plans depended. I suspect it wasn’t a question of her forbidding him to return home – she just turned large, tear-filled eyes his way and told him how much she depended on him. In September of 1326, Prince Edward returned to England – at the head of an army with his mother by his side. Isabella made it very clear that she was only here to restore law and order to the realm – and safe-guard her son’s claim on the throne. Young and handsome, Prince Edward elicited loud cheers of approbation, the figurehead of an invasion that had as its final purpose to destroy Despenser and bring King Edward II to heel. What our prince thought of all this we don’t know – but those who loved him, like Adam de Guirande does in my novel, must have commiserated with their young lord, torn in two by his parents. Adam de Guirande has barely survived the aftermath of Roger Mortimer’s rebellion in 1321. When Mortimer manages to escape the Tower and flee to France, anyone who has ever served Mortimer becomes a potential traitor – at least in the eyes of King Edward II and his royal chancellor, Hugh Despenser. Adam must conduct a careful balancing act to keep himself and his family alive. Fortunately, he has two formidable allies: Queen Isabella and his wife, Kit. England late in 1323 is a place afflicted by fear. Now that the king’s greatest traitor, Roger Mortimer, has managed to evade royal justice, the king and his beloved Despenser see dissidents and rebels everywhere – among Mortimer’s former men, but also in the queen, Isabella of France. Their suspicions are not unfounded. 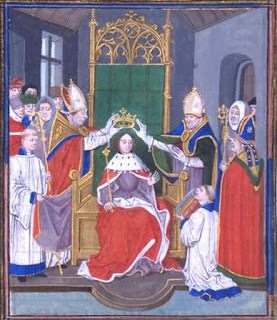 Tired of being relegated to the background by the king’s grasping favourite, Isabella has decided it is time to act – to safeguard her own position, but also that of her son, Edward of Windsor. As Adam de Guirande has pledged himself to Prince Edward he is automatically drawn into the queen’s plans – whether he likes it or not. Yet again, Kit and Adam are forced to take part in a complicated game of intrigue and politics. Yet again, they risk their lives – and that of those they hold dear – as the king and Mortimer face off. Once again, England is plunged into war – and this time it will not end until either Despenser or Mortimer is dead. 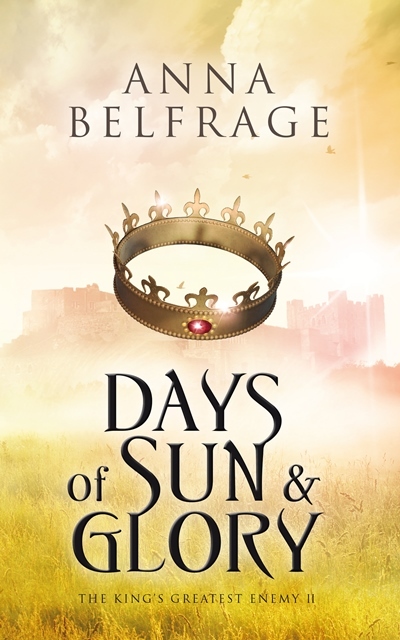 To win a copy of Days of Sun & Glory by Anna Belfrage, please enter via the Gleam form below. – Giveaway ends at 11:59pm EST on September 29th. You must be 18 or older to enter.